Fatehpur Sikri is a Moghul architectural ensemble that has been influential on the evolution of town planning. Between 1570 and 1586 Fatehpur Sikri was the capital of the Moghul-empire. The Moghuls experienced their hey-day, and their leader Akbar wanted to construct a dreamcity where he and his large harem could live a glorious life. However, because of unknown reasons (lack of water? a large war somewhere else in the empire?) Akbar and his followers left the city suddenly. What is remaining now is a very well preserved ghost town, that gives insight in the architectural style from its period in history. The city has a mosque, several palaces, a caravanserai and broad streets and squares. The buildings are made of red sandstone. As you could expect from a ghosttown, the atmosphere is somewhat dead. It clearly is a monument, and not a place where people live (or even have been living). Only the big Mosque with the tombs of saints is regularly visited by pelgrims. Fatehpur Sikri is located only 40 kilometers distance from Agra, the city of the Taj Mahal and the Red Fort. When you are in the area, Fatehpur deserves a visit of a few hours. But beware: it can get terribly hot there. I visited this WHS in December 2011. 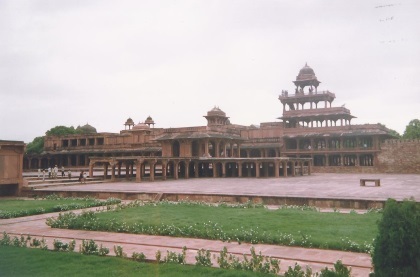 In the 16th century, Fatehpur Sikri (the city of victory) was the capital of the Mughal Empire. Nowadays it is simply a ghost city with a huge archaeological site and an large mosque next to it. The central pillar of the Diwan-i-khas was the highlight of my visit. Many people can get "forted out" in northern India despite the magnificence of places like Meherengarh and Udaipur. However, there is something appealingly other worldly about the deserted Fatehpur Sikri. I led trips in India in 2005-2006 and found that despite the formidable heat and the touts, people were moved by something at Sikri. Go there knowing a bit about the intellectual curiosity of Akbar, his carefully considered quest for religious truth, the story of his involvement with Pir Salim Chisti - these bring Fatehpur Sikri to life and you can imagine great debates occurring in the Diwan-i-Khas. Don't miss Chisti's tomb. Also, I recommend you read Bamber Gasgoine's "Great Moghuls" or the recent Salman Rushdie book "The Enchantress of Florence." Look for Akbar's jewelled sword at Meherengarh in Jodphur too! Much as I was spellbound by Fatehpur Sikri; I was equally disappointed with the sad- neglected state of the monument. It was dirty, litter strewn across the courtyard. Half-eaten food/fruits/banana peels were left around with flies on them. Why cant ASI or the caretakers of Fatehpur Sikri stop people from eating inside the premises...? The hawkers in the premises spoil the beauty of the majestic monument - Especially near the Bulund Darwaza. Worse of all, as soon as we arrived in Fatepur Sikri, our car was surrounded by tourist guides who showed us their pass claiming to be official tourist guide. We finally settled for one at a haggled price of Rs. 350/- (which I thought was still over priced for a 20 mins guide). He assured us that the parking and rickshaw charges from the car park to the monument were included in the price. Hence we agreed to Rs. 350/-. We were conned by this tourist guide into buying a Chadder at the site for Rs 600/- which is not necessary or required. When we were done with the tour, the guide took the money and guided us to the waiting rickshaw. On reaching the parking lot, the rickshaw driver demanded for Rs. 100 and we even had pay another Rs. 100 for the parking charges. Quite obviously the guide had done the infamous disappearing trick. All in all it left a very unpleasant feeling about the whole visit. And surprising there are no officials to control the sorry state of affairs. Why are these heritage sites a haven for cheaters and con-men..? I visited this site way back in about 1990, with a rather roguish Indian tour guide - We arrived a full two hours before it officailly opened and he bribed our way in.The result was that we had the entire site to ourselves, which is a huge privellage in a 'deserted' city which is also a tourist Mecca. We were leaving just as the crowds arrived to replace the birdsong which had accompanied our tour with the din of modern tourism. That said even when crowded this is a large fascinating, atractive, site, with plenty to see. It is also close enough to the Taj Mahal that you could do both in one day. It does however stand on its own two feet and I would highly recomend it. And if you can bribe your way in before it officially opens, do! Fatehpur Sikri was built by Emperor Akbar on the site where the holy man, who Akbar believed to have a power for giving an heir to him, had lived. The holy man’s home was in a very dry area where normal people will not expected to build a home, but not for this great emperor. Akbar built the whole city of Fatehpur Sikri with grand palace complex and enormous mosque in the centre of semi-desert area. He moved his court to this place for just to face a water shortage problem. After Akbar passed away, this city was abandoned like a ghost town. My friend and I visited Fatehpur Sikri in early morning to avoid the summer heat of India, we reached Fatehpur Sikri and found out that our hired guide was still in Agra and maybe late for one hour. Our driver decided to hire a new guide for us; after we got a new guide it was the time to discover Fatehpur Sikri. The red sandstone palace complex of Akbar is really beautiful with many buildings. The Hall of Private Audience has a unique interior symbolizing Akbar’s religion policy, the Faith of god or Din-i-Ilahi, which brought all religious doctrines in India and made it as a new belief. It was really nice to see many religion symbols in one place. The Treasury was designed for emperor to play hide and seek with his concubine! The harem section was really amazing with many halls for each queens and favorite concubines who came from different religions. Akbar must have a very big harem as he built five storey building for his women to see the view. After the palace complex, we visited the grand mosque of this town. The gate is really big, but inside is just a normal mosque. 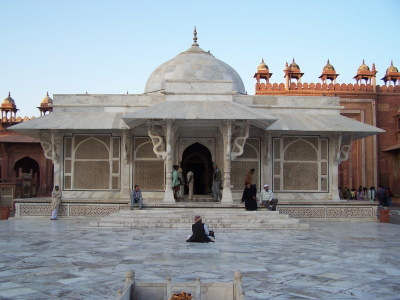 The center of this mosque is the Tomb of Akbar’s holy man which beautifully constructed in white marble. The tomb was full with worshippers mostly a women maybe they also want a baby like Akbar. After we finished the tour and back to the entrance gate, we met our real guide who was late. Our guide offered us to tour Fatehpur Sikri again! You may think this is ridiculous, but we accepted his free offer as we love this place and seeing it again would be nice, so in that day we had seen Fatehpur Sikri twice! Fatehpur Sikri is a very beautiful place and very near Agra where Taj Mahal located, so you can make this place as a one day excursion like us. You will enjoy the wonder of Akbar’s architectural style which is better than the one in Agra Fort (the Akbar section not Shah Jahan one). But don’t go to any hidden corners as someone’s urine will ruin your feelings and most important, your nose. An outstanding memorial to Akbar's arrogance! I would highly recommend a visit to Fatepur Sikri, but please be aware that it is a tourist trap of the highest order. There are touts and marble salesmen everywhere. Still, this cannot detract from the majesty of Akbar's Grand Mosque. The gateway is simple jaw-dropping. Unfortunately the site is need of some loving care and attention from Archeological Survey of India - many parts are in a tragic state of repair. Chahar Bagh Gardens: "Hawa Mahal, the Palace of Winds. This small-screened wind tower faces the garden and is attached to the palace. The garden is laid out in the Char Bagh style with straight walls intersecting at right angles and divided by shallow channels." Board Games: Courtyard for playing "Pachisi". A type of Ludo played by the Mughal Emperor Akbar using girls from his harem as "counters" with him "running" the game from a central raised chair!